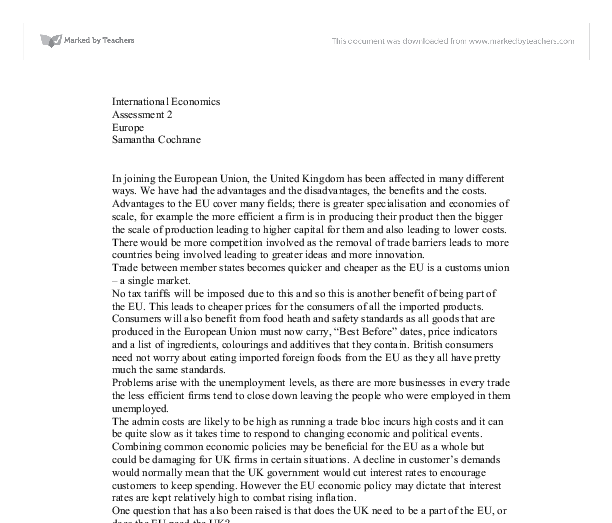 International Economics Assessment 2 Europe Samantha Cochrane In joining the European Union, the United Kingdom has been affected in many different ways. We have had the advantages and the disadvantages, the benefits and the costs. Advantages to the EU cover many fields; there is greater specialisation and economies of scale, for example the more efficient a firm is in producing their product then the bigger the scale of production leading to higher capital for them and also leading to lower costs. There would be more competition involved as the removal of trade barriers leads to more countries being involved leading to greater ideas and more innovation. Trade between member states becomes quicker and cheaper as the EU is a customs union - a single market. No tax tariffs will be imposed due to this and so this is another benefit of being part of the EU. This leads to cheaper prices for the consumers of all the imported products. Consumers will also benefit from food heath and safety standards as all goods that are produced in the European Union must now carry, "Best Before" dates, price indicators and a list of ingredients, colourings and additives that they contain. ...read more. It is common knowledge that the pound is stronger than the euro, this comes from the UK outperforming other competitive countries and substantially becoming more competitive. Interest rates were also higher in the UK and so more money flowed into the UK economy. However the government were able to use certain polices to get into this possible economic situation and the Bank of England was able to adjust interest rates in order to control inflation. Nevertheless if the UK chooses to join the Euro then both exchange rate policy and many other polices and interest rates will be in control of the European Bank and I feel that this could lead to certain problems arising. For example, there are many different countries in the EU and each country has its own economy, thus, there are many different economies within the EU. At any time one economy may be booming whilst another may not e.g. Germany may be in a boom while France is in a recession, however within France there may be areas if boom and areas of recession, for example Paris may be in a boom while St Etienne may be in a recession leading to rich and poor regions. ...read more. As lower inflation rates are common within the EU the Bank of England may decrease the interest rates on short term loans in order to generate investment which in turn would make it cheaper for firms to take out loans. This way firms would benefit financially if they were planning to take out loans to increase their firms and homeowners would benefit from cheaper mortgages. Multi national companies may be more willing to invest in building firms in the UK as before they have been wary due to the fact that the value of services and goods they provide may decrease due to the fluctuation rates between the pound and the euro, if the UK was part of the euro then these problems would vanish and therefore the UK may benefit from more jobs and more business. The removal of the two currency's may encourage more investment as the investors would no longer have the traditional worry about moving their money into a currency other than their own as the currency would be exactly the same. 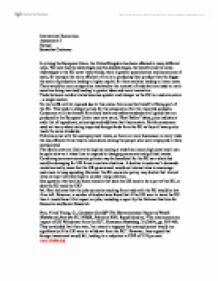 Overall there would be a more efficient and streamlined business across the euro zones. ...read more. These conversion rates will be calculated on 31 December 1998 and irrevocably fixed by a European Commission Regulation which will come into effect on 1 January 1999. The conversion rates must be expressed to six significant figures (which should not be confused with decimal places). This was due to the government controlling resources and the lack of foreign investment. There is therefore a large willing labour pool that are flexible in terms of working hours, which companies are able to exploit. Most employees are willing to work 40-42 hours per week and there are quite often a lot fewer holidays available. 367 June 14-20, 2003 p. 13). It will make it easier to travel and do business across Europe, but it also throws up broader questions of convenience and expense to Britain. As was the case in Germany: "Shopkeepers carry the biggest burden in that they will in effect find themselves converted into the unofficial moneychangers of Britain. one of the official objectives of what is then called the European Economic Community. 1970 Prime Minister of Luxembourg, Pierre Werner, presents plan to achieve EMU within 10 years. Plan is largely abandoned in the economic disruption which followed the quadrupling of oil prices by OPEC in 1973-74. Should Britain join the Euro? A report into the pro's and cons.